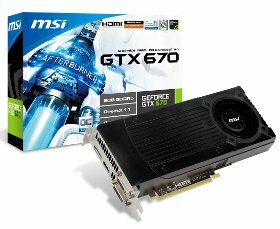 MSI introduces its GeForce GTX 670 card, with stock cooler and stock clockspeeds. Today leading international mainboard and graphics card maker MSI officially announces the new GeForce GTX 670 graphics card featuring the latest 28nm GeForce GTX 670 GPU and 2GB GDDR5 memory; supports PCI Express 3.0 standard to provide better performance and power efficiency than previous generation. The GeForce GTX 670 graphics card features NVIDIA’s GPU Boost technology which allows the core clock to be automatically adjusted on the fly for optimal in-game performance. When used with the MSI Afterburner overclocking utility, the power limit and clock offset can be adjusted as well for better overclocking capability; GPU overvoltage function to boost overclocking potential up to 22%! A single card is able to also support NVIDIA 3DVision Surround technology for up to four monitors to give gamers the best in-game experience. The MSI GeForce GTX 670 graphics card supports NVIDIA's GPU Boost technology that allows the core clock to be adjusted on the fly for optimal in-game performance. When used with MSI's exclusive Afterburner overclocking utility, gamers can control the power limit and clock offset for better overclocking capability. Additionally, MSI GeForce GTX 670 graphics card supports GPU overvoltage function to boost overclocking potential up to 22%! Afterburner supports video/audio capturing function Predator and can even use smart phones to control the graphics card in desktop. When combined with the Kombustor burn-in testing function, it is an indispensable tool for enthusiasts looking to get the most out of their graphics card. The MSI GeForce GTX 670 graphics card uses the 28nm GeForce GTX 670 GPU and supports the latest PCI Express Gen 3 standards. This advanced manufacturing technology reduces operating temperatures and improves performance, and when combined with the latest connectivity standard it can also deliver a staggering 32GB/s of bandwidth with compatible CPUs and mainboards. For gamers, this means an even better in-game experience with 42% more performance than previous generation GeForce GTX 570 graphics cards. Apart from supporting the latest DirectX 11 technology, the MSI GeForce GTX 670 graphics card has the ability to use NVIDIA 3DVision Surround using three 3D monitors and 3D glasses with just a single card. Gamers will be able to enjoy the spectacular visuals of 3D games and movies. Additionally, support for up to four displays driven by one graphics card allows gamers to make the most of multiple-monitor configurations.